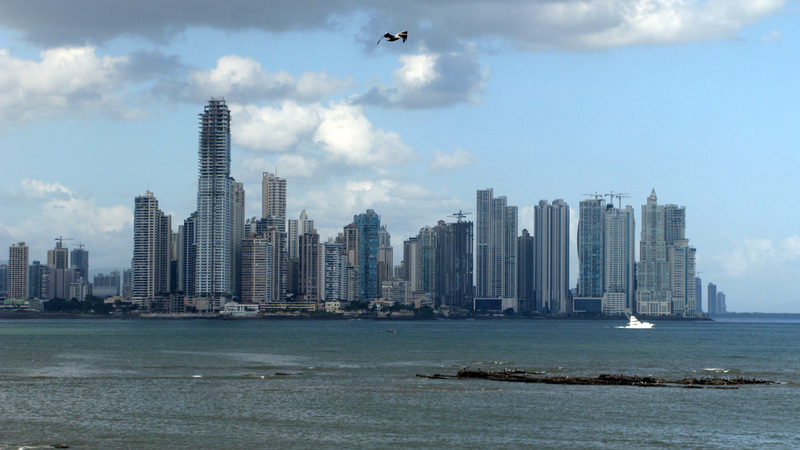 Panama City – the biggest capital city in Central America. After 5 fun-filled days exploring the archipelago of Bocas del Toro, we grabbed a water taxi back to the mainland. We decided to start making our way directly to Panama City even though this meant skipping over some of the sites of Panama along the way. We’ve really enjoyed the cloud forests, tropical wildlife, topography, coast lines and gallo pinto (black beans and rice) of Central America, but we are getting eager to hop continents and continue our journey south. South America is huge! On the drive from Bocas to David. 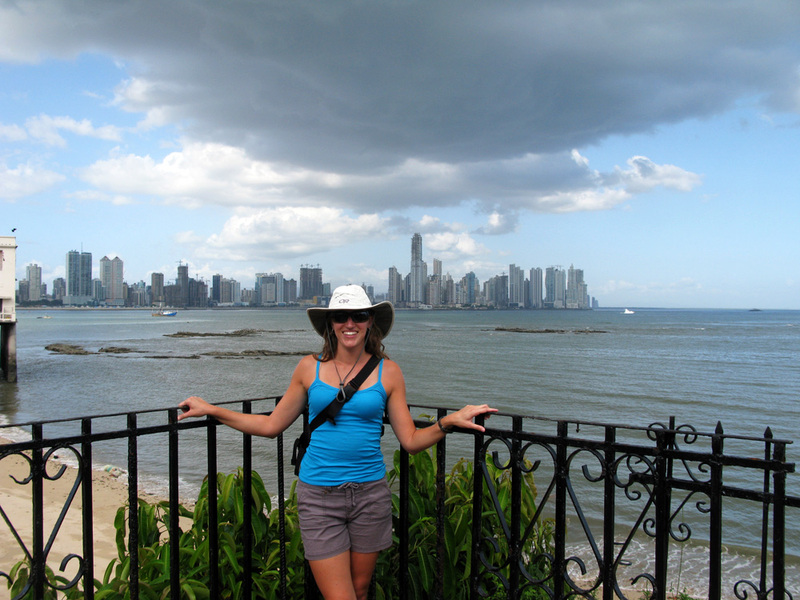 Our first stop was in David, the second largest city in Panama, just minutes from the Pan-American highway. We stayed one night in the Purple House where literally everything from the linens and dishes to the walls and wall hangings were purple. It was a bit much, but certainly a friendly atmosphere. The next morning we boarded a double-decker bus and sat right up front on the second floor. 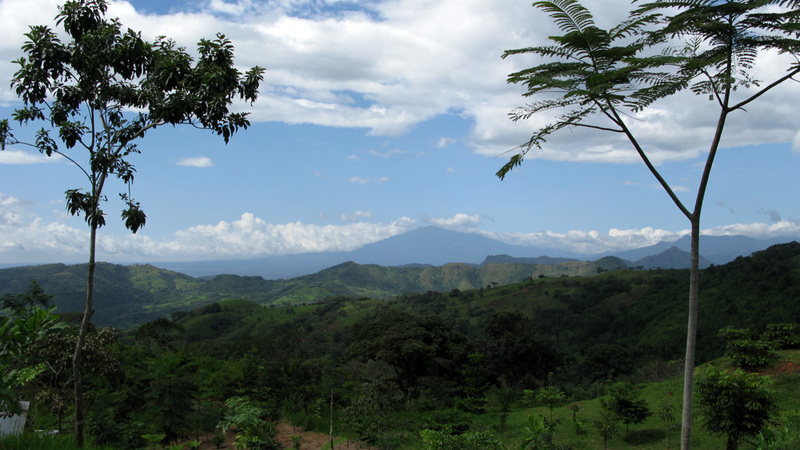 We had a panoramic view of the Panamanian countryside the entire 6 hours to the city. We arrived in the city at the largest bus terminal in the world. Probably not, but it definitely looked like it. Most of these are retired school buses from the US and Canada that have gone through a flashy paint job and pump an incredible amount of smoke in the air. We settled into our small hotel near the financial district and spent the next few days touring the city and exploring other neighborhoods, mostly because of the surprising lack of restaurants in ours. We visited the old part of town, Casco Viejo, which at one point was inhabited by the elite. They have since fled, but have left remnants of a charming colonial city. The city from Casco Viejo. 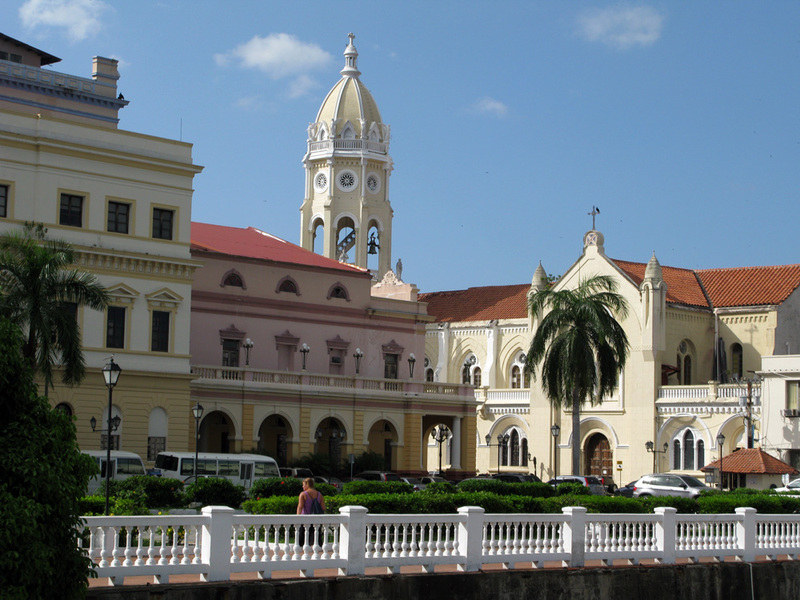 The National Palace in Casco Viejo. 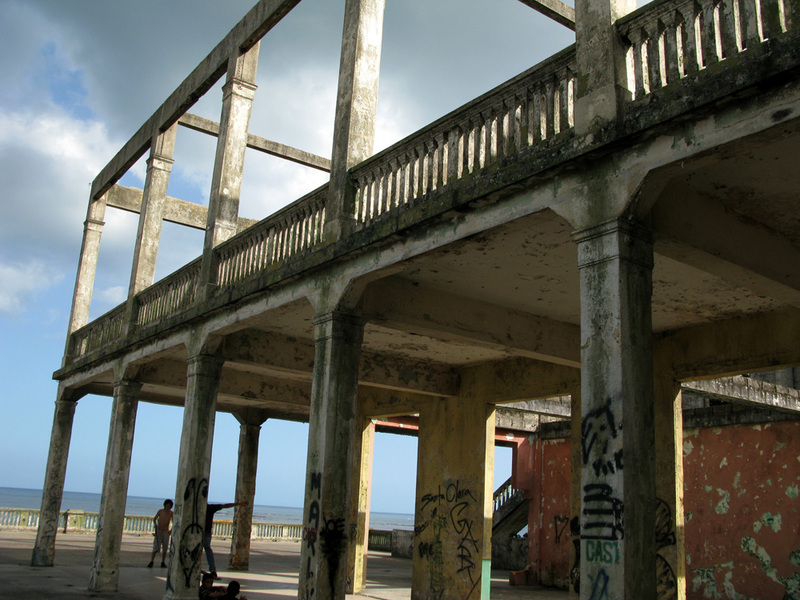 The old Panamanian Defense Forces Club – it was destroyed in 1989 during the US invasion. 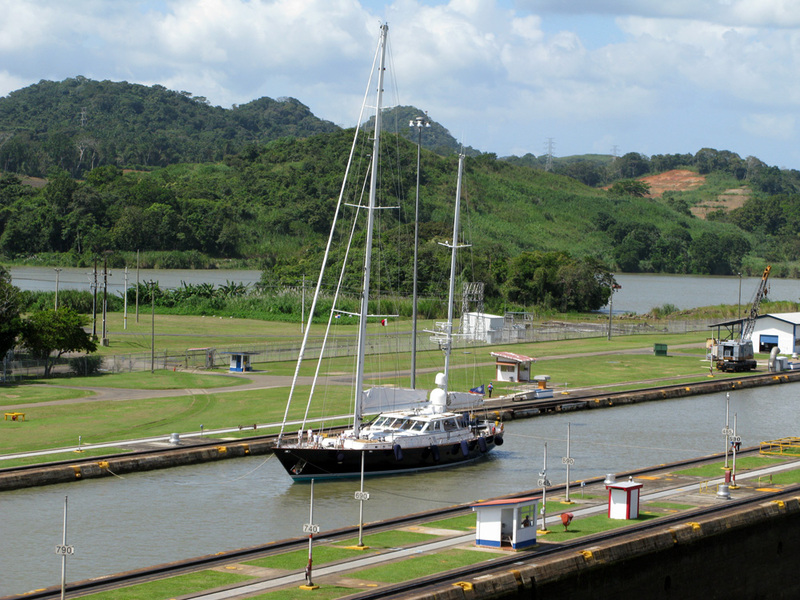 A visit to Panama City wouldn’t be complete without a trip to the Panama Canal, one of the world’s greatest engineering marvels. It was amazing to see first-hand how a system completed in 1914 can run so smoothly to this day and can manage a slew of massive ships on a daily basis. 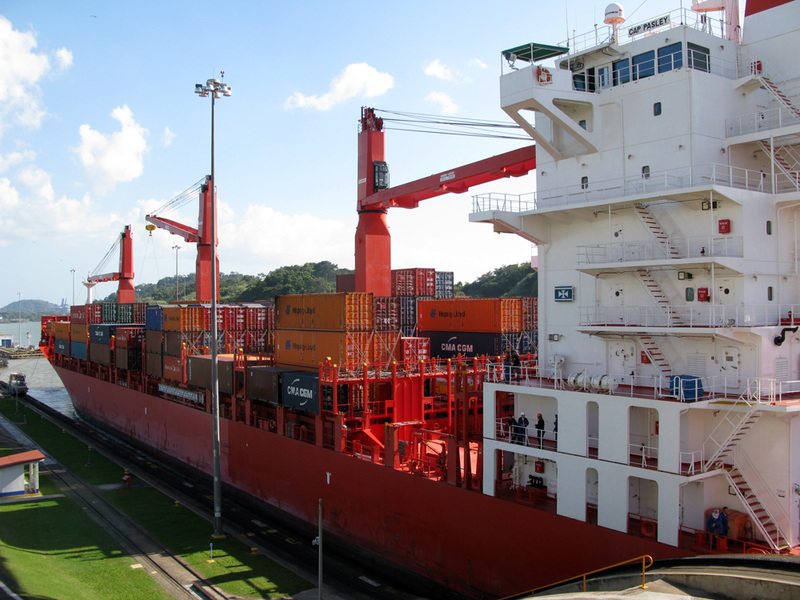 We watched as yachts, sailboats and container ships were guided into the Miraflores locks and lowered to the level of the Pacific Ocean. Some big ships must pay nearly $300,000 to cross the isthmus. It really puts the price of consumer goods into perspective. 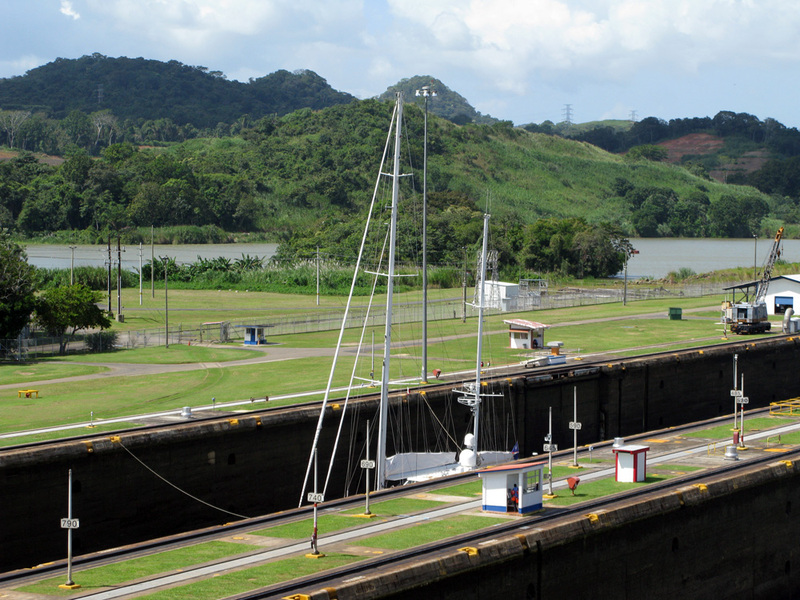 The first set of locks on the Pacific side of the Panama Canal. A 120-foot sailboat coming waits for passage to the Pacific in the first chamber. Before it can pass, it must be lowered to sea level. 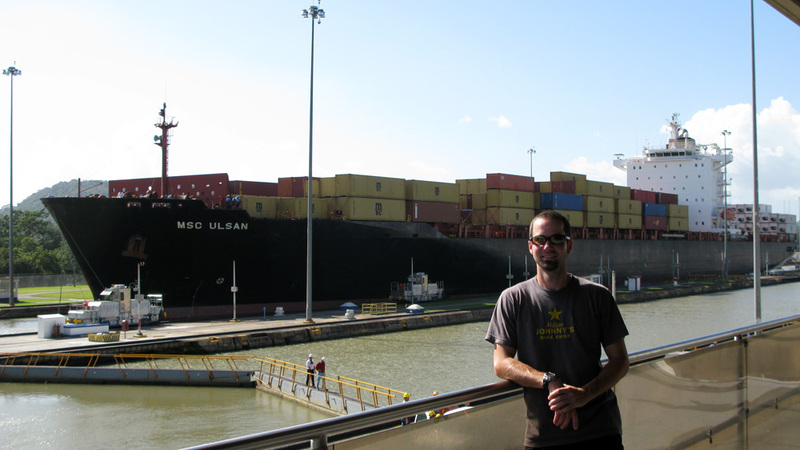 A container ship squeezes into the first chamber – it takes 10-12 hours to cross the isthmus. A German container ship waits for its final descent to sea level. While in Panama City, we were also very happy to reconnect with our friends Tamsin and Paul, who were here spending the last few days of their trip before heading home. We enjoyed several dinners together and reminisced over our time traveling through Central America. 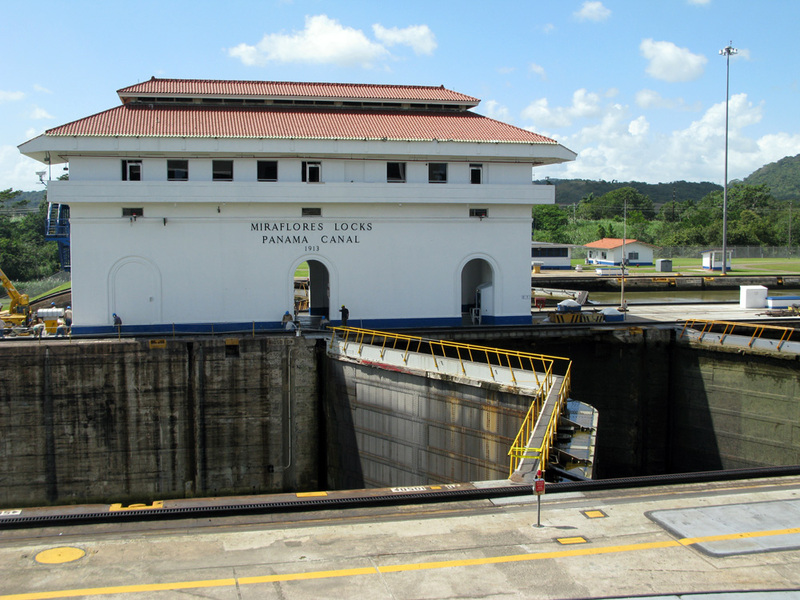 As they got ready to board a plane back home, we got ready to board a sailboat for a 5-day cruise along the Caribbean coast of Panama through the San Blas islands until we cross another threshold and set foot in Colombia, a new country on a new continent! hey you guys we made it home , did you make it to columbia yet! I continue to enjoy reading about your travels and looking at your beautiful pictures!!! Happy Belated Birthday Patrick! Hoping it was fun! Merry Christmas! Oh my goodness it really does make a ZIP sound doesn’t it? Fun ride! Thanks for the video. 16″ of snow in Philly last weekend; Lots everywhere else in the East too – you guys missed it!